Designed and built in the U.S. from heavy-gauge four-inch diameter American T304 stainless steel, meticulously TIG welded, the CMS Performance GT3 exhaust replaces your heavy, restrictive OEM center muffler. The unique design increases exhaust gas velocity and flow capacity, adding over 11 horsepower and 11 lbs-ft of torque at the wheels (and removing 10+ lbs. of rear end weight). Perhaps best of all, it unleashes an incredible engine snarl at low to mid revs that turns into an intoxicating all-out flat six wail above 6,000 RPM! 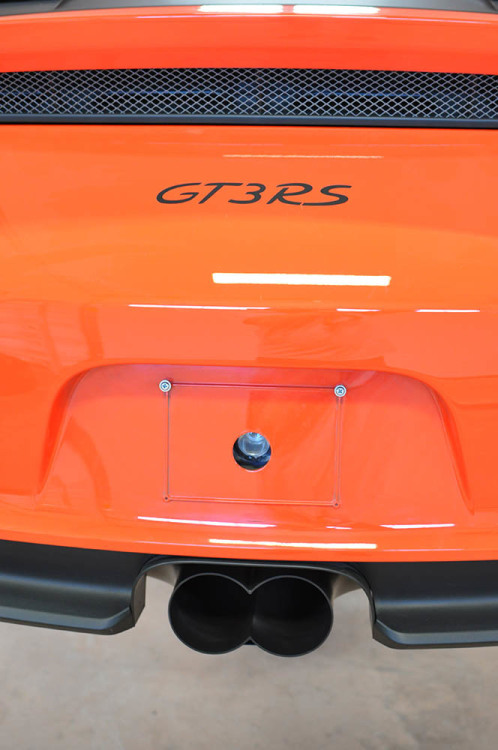 CMS Performance makes driving the 991 GT3 and GT3RS the exhilarating experience it was meant to be. There's no drone anywhere in the RPM range: part throttle, full throttle, idle, no drone. We engineered the infinity-collector outlet using the same functional design principle used in racing header collectors. Each exhaust pulse creates a vacuum in the outlet; the next pulse meets that vacuum and increases in velocity, leaving a vacuum, and so on. This scavenging effect increases gas velocity, flow capacity, and ultimately power. The harmonic effect creates that incredible sound! This form-follows-function design also allowed us to relax the radius on each curved outlet pipe, further improving flow. The sonic properties of the naturally scavenged exhaust pulses eliminate the need for a power-robbing cross pipe others use to try to tame drone. 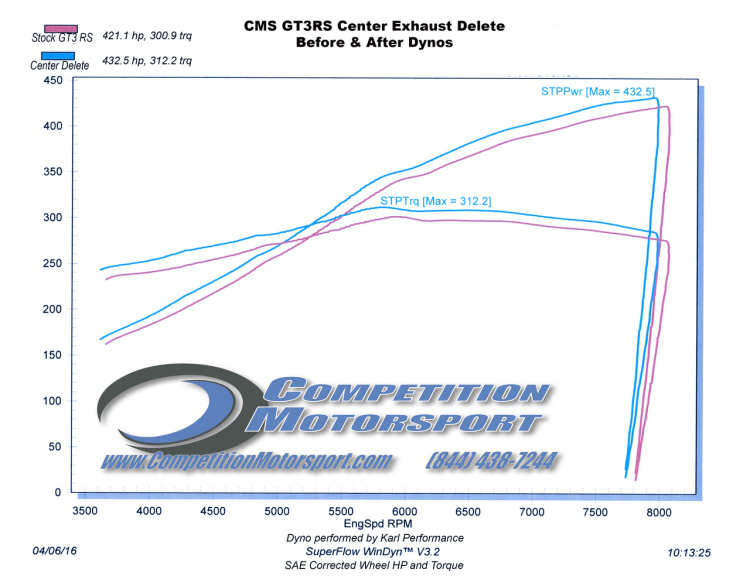 Instead, the CMS Performance GT3 exhaust makes power and sounds incredible across the rev range. Each exhaust is meticulously crafted from the highest-quality 304 stainless steel, the result of our unwavering focus on workmanship, design, and premium materials. 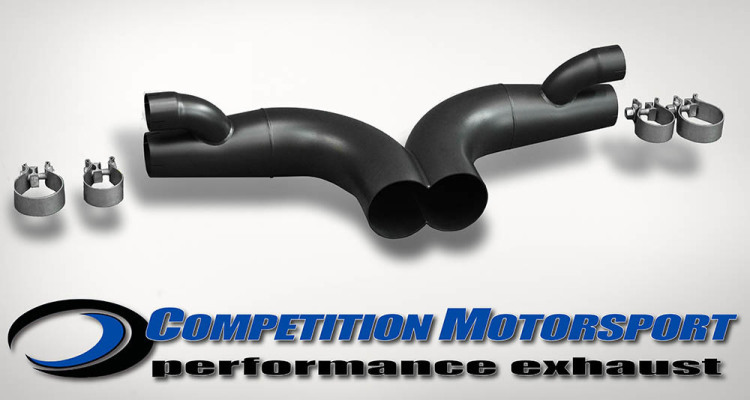 The CMS Performance GT3 exhaust is available either in a natural stainless steel finish or with an ultra-high temp satin black 2000°F ceramic coating.